Club Penguin Cheats by Mimo777 Club Penguin Cheats by Mimo777: Club Penguin's New Music! 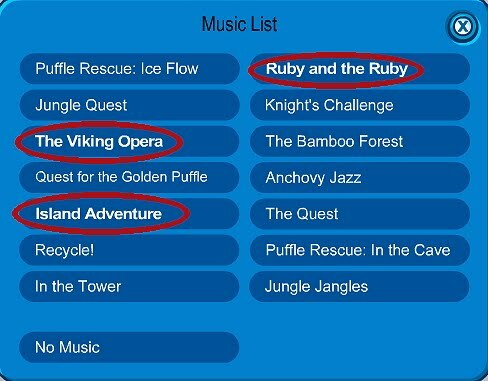 I really like the Island Adventure music the best! Which one do you like? Mimo, just wanted to say that your cheat site totally works and is THE BEST! If you see me on Club penguin or Tootsvile say hi or something, the name is Mollie7pink for both games! PS. Cant find the tech light stuff at the mall on Tootsvile! Sweet! I'll have to check that out. Thanks! The Toot Tech LightField's are in the Fasion store at the Tootsville Mall. After you go to the Fasion store go to the accessories section and they will be at the top. They are 1,000 peanuts each. And If I see you I'll say hi too! Or does he... HMMMM... Lol, jk. P.S. If you see me add me or at least say hi plz!!!!!!!! I still have the penguin band boogie music in my iggy, ive had it for almost a year now!! Hey MImo me sticks, Im on a vacation so can rarly use internet. Thanks for promotion hope to mod soon. Check emails. ok so this has nothing to do with the new music but i think it is interesting. i was looking at the newspaper and i noticed that on the joke page that the first question didn't that the Q and A in front of the joke and answers.